The last thing fifth-grader Wren Evans remembers (before the world as she knew it disappeared) is getting off the school bus to discover her house engulfed in flames. What happens next can't be explained as Wren finds herself in a beautiful valley with a shepherd named David--in ancient Israel Imagine. . .The Giant's Fall is the fourth release in an exciting epic adventure series for kids ages 8 to 12 written by schoolteacher Matt Koceich. The Imagine series brings the Bible to life for today's kids as they ponder what it would be like to live through a monumental biblical event. 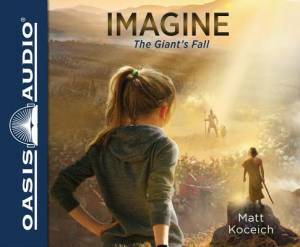 Imagine...the Giant's Fall (Library Edition) was published by Oasis Audio in May 2019. The ISBN for Imagine...the Giant's Fall (Library Edition) is 9781631084461. Be the first to review Imagine...the Giant's Fall (Library Edition)! Got a question? No problem! Just click here to ask us about Imagine...the Giant's Fall (Library Edition).